Someone asked me to do one of these yesterday, and it reminded me of one of my favorite music review sites, The Venn Review. The primary difference between music and writing for me is the payoff: one pays the bills, one feeds the soul. Lucky to know I love them both. remarkable! 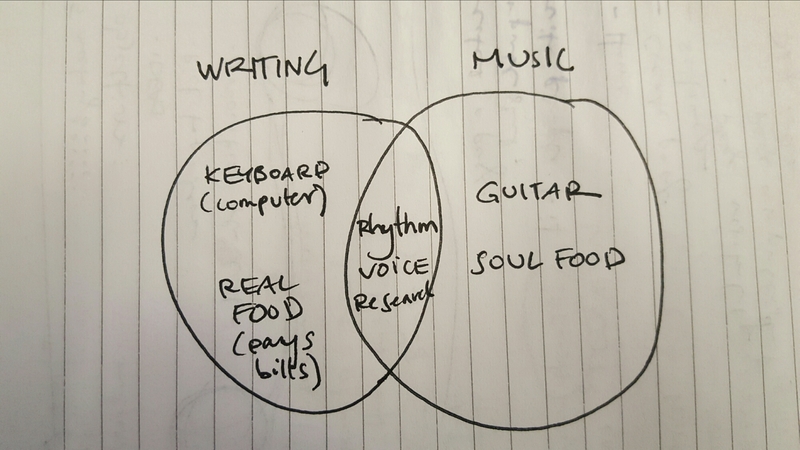 I never saw these two parts of what I do (words and music) expressed in a Venn diagram before. Never thought about it that way either. Did you see the link to the music review site that uses Venn Diagrams to describe awesome new music? Symbolic — DJ Midnightt played “Wild and Kind” on WQFS just as your post came up. What helps you the most? Purchase from cdbaby, your website, other? That is super cool. Thanks Scott! I’m not really sure about that Scott. I think anything helps!